We’re back in the city and the holidays are over, at least for now. I simply loved spending time away from home, especially in both of our families summer houses and in the archipelago, as we got to be in nature for most of the time. All the piled up mail, bills, and a long list of to-dos weren’t exactly the most welcoming thing to come home to, but all in all, it’s good to be back. We started playing tennis with my man, our weekly runs with one of my girlfriends are once again starting, and it feels nice to be back in the kitchen cooking. Even though it’s still summer and I’m refusing to think of August as the beginning of autumn, there’s a certain chill in the air. It’s been super windy the last few days with some rain, so it’s certainly isn’t bikini weather anymore. Along with pulling out my jumpers and jackets from the closet, I’ve been craving for warming, nourishing meals with plenty of summer vegetables. I’ve been meaning to make stuffed zucchini boats for a while already, so when the craving hit me hard this week, I knew I had to make them soon. 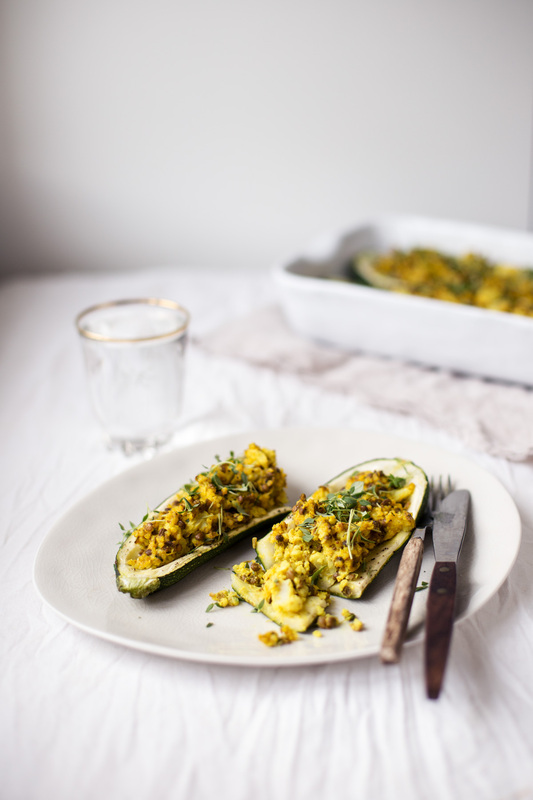 The thing I love about zucchini boats is that they’re warming and filling, like a total comfort food, but without being heavy. And as it’s zucchini season right now, there are loads of big and beautiful zucchinis out there in the markets. There are loads of options to stuff these with, but this time I came up with a creamy mix of cooked millet, lentils, cauliflower and coconut milk. I used turmeric to give them a pretty color and a nourishing health-boost, and fresh thyme to bring some herb-y flavors in the mix. You could top these with some feta if you like, but they’re delicious as they are, and these were just what I needed right now. Comforting and simple, and a grounding start to new projects, new challenges, and the beautiful last few weeks of August. 1. Rinse the millet carefully with cold water and place to a saucepan with water. Bring to a boil and cook on low heat for about 15-20 minutes, or until the millet is cooked. Add a little water while cooking, if necessary. 2. Preheat the oven to 400 F / 200 C. Rinse the zucchinis and cut them in half lengthwise. To make boats, remove the core with the help of a knife and a spoon and set aside. (I think the easiest way is to first use a knife and then scrape the insides with a spoon). 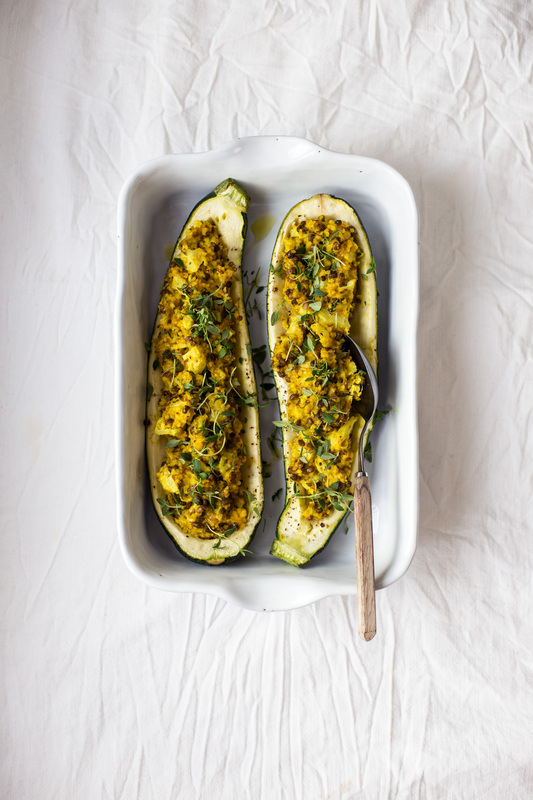 Place the zucchini halves into a baking dish or baking tray covered with parchment paper. Sprinkle with olive oil and lightly season with salt and pepper. Bake for about 15 minutes until the zucchinis are slightly softened. 3. Cut the cauliflower into very small pieces. Rinse and drain the lentils. Cut the leftover zucchini into small cubes (I used maybe half of the leftover, as it was so much). Heat a large frying pan and sauté the zucchini and cauliflower with some olive oil for a few minutes. Then add the cooked millet and lentils and fry in low heat for a couple of minutes. Add the coconut milk and spices and mix well. Taste, and adjust to your liking. 4. Divide the filling to the zucchini boats and place back in the oven. Bake for about 10-15 minutes, until the filling has gotten a little color and the zucchinis are softened. Take from the oven, top with fresh thyme, serve and enjoy! Tagged autumn, lunch & dinner, millet, summer, vegan, vegetables, vegetarian. Create a moment of magic for yourself with this calming Blueberry Yogurt Face Mask and refreshing Cucumber & Honeydew Shake!